Steven Gullotta Dark Electro, Industrial Toward the very end of 2017 on December 22nd when the world was preparing for the return of Santa Claus, Droid Sector Decay decided to upset the status quo by releasing their unholy abomination titled "Posesión Satánica" unto the world. Released via Underground Industrial Records, "Posesión Satánica" was technically released as a single but contained a huge amount of content both musically and - if you can afford it - physically. The digital version of the album comes with twelve songs split between two CDs. Of course, the six and a half minute juggernaut that is 'Posesión Satánica' kicks off the album. The beat of the music screams early electro-industrial of the mid to late eighties as plenty of religious riddled samples spill out in the background. With a touch of heavily distorted vocals, the song sounds off as if it crawled out of Hell when it was never supposed to. What I guess to be is considered the B-side came next titled 'A Dark Deity of Grotesque' which continues the heavy machine industrial chaos. A lot of the bonus tracks on the first CD, such as 'Le Pessimisme de la Volonté', head toward the boot stomping side of EBM more-so the rough, industrial and experimental edge that the first two songs gave way to. Much the same can be said for the songs on the second CD despite both 'Connected & Consumed' and 'Still' containing some otherwise rougher elements. Synthpop producer Paul Rhodes makes an appearance on the final song of CD2 titled 'Flesh Reality'. I suppose that's why this song had more bounce to it than what I had heard previously. Now, while the music on "Posesión Satánica" is glorious, the full physical package made me appreciate it even more. Containing both CDs, a seven inch vinyl of the album, a cassette tape, an A3 poster, button pin, and a postcard, this box set edition is for the die hard fan. There are currently only three of these left, so if you like what you're hearing you may want to hop on that fast. This is a stand out release on Underground Industrial Records. A fast, fun, and fluid romp through old school industrial and EBM. Toward the very end of 2017 on December 22nd when the world was preparing for the return of Santa Claus, Droid Sector Decay decided to upset the status quo by releasing their unholy abomination titled "Posesión Satánica" unto the world. 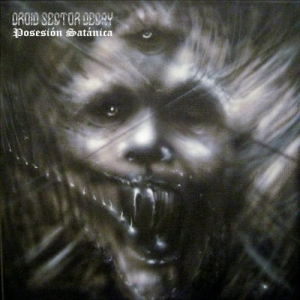 Released via Underground Industrial Records, "Posesión Satánica" was technically released as a single but contained a huge amount of content both musically and - if you can afford it - physically. Dark experimental producer Lana del Rabies releases new album "Shadow World"